Aubrey is turning 10 years old and is a 4 th grader at Laurence School. 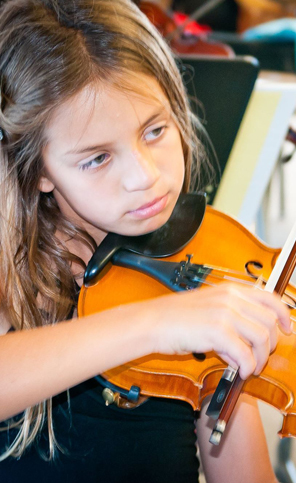 She began studying the violin at age 5 and became a student of Beth Elliot by age 6. She is now the Concertmaster of the Kadima Junior Philharmonic and the Principal Violinist of the Kadima Senior Philharmonic. When Aubrey is not playing her violin, she is playing soccer, baking one of her scrumptious creations or choreographing dance routines with her sister and friends. Aubrey is extremely honored to play in this session’s concert as a featured soloist. She is thankful for all the inspiration and dedication given by her teachers, Beth Elliott and Eric KM Clark. Her family also thanks them for this most wonderful gift of music in their lives!